Where will you hold your Casino event? How will you set it up? Where will you get the equipment you need? How will you incorporate fundraising? Where will you hold your Casino Night fundraiser? Think location, convenience, and size of group. Budget. You’ll need ample space for game tables, chairs, and a bar. The last thing you want is to go to all the effort of planning the event only to find out parking is limited. Or, there’s no place for your guests to sit and enjoy the games. Chances are you don’t have you own slot machines. So, how will you set up a Casino Night fundraiser without all the equipment? Here’s where a party planning company such as Entertainment Unlimited can help you. We’ll discuss your size group, what games you want to offer, how many dealers you’ll need to manage tables for Blackjack and Texas Hold’em, for example, and what you’ll need in way of cards and chips. Also important are the pros and cons to various venues that can accommodate you. Keep the “fun” in fundraising! Why not raise the bar a notch and theme your Casino Night fundraiser? From the Roaring ‘20s to Old Hollywood glam, the sky is the limit. Want it to be formal? Think tuxedos and formal attire. Even a simple Vegas-inspired night is a fun way to get your guests in the mood to gamble…and fundraise. Hire or ask volunteers to work the event as valet parkers. Or offer an Uber service that you arrange for your guests. It adds a nice touch and shows that you’ve thought through the details. Imagine a live band playing Frank Sinatra to set the tone for your classy, formal affair. Or an incredible DJ to bring your 80s themed Casino Night fundraiser to life. Think big and think Vegas. 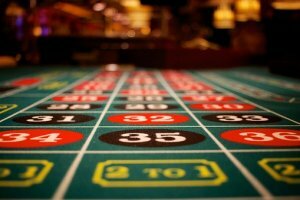 For Casino Night fundraisers, we find there are a variety of ways to go about it. You can sell tickets ahead of time and then once your guests walk through the door, the rest of the affair involves fake money or chips. You can charge at the bar or include them in the price of admission. Be sure to check the local laws about liquor licenses in your area and make it clear the event is adult-only on the invitation. Consider hiring a professional party planner such as Entertainment Unlimited. We can help you from conception and planning to the main affair and cleanup. Call us today to learn more about how we’ve been helping companies pull off Casino Night fundraisers time after time.